This easy and delicious Fettuccine Carbonara Recipe is a quick and easy dinner idea! It’s rich, creamy and ready in 30 minutes! Cook fettuccine according to package directions, adding peas during last 2 minutes of cooking; drain. Meanwhile, melt butter in 2-quart saucepan and cook onion over medium-high heat, stirring occasionally, 3 minutes or until onion is tender. Stir in sauce and bacon; heat through. 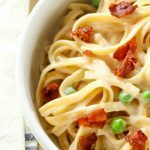 Toss with hot fettuccine and peas. Garnish, if desired, with grated Parmesan cheese and ground black pepper.